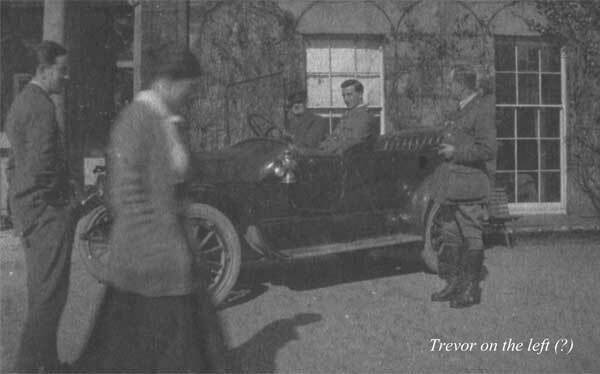 The Letters Home of Lt. E. Trevor Evans, R.F.C., R.A.F. The following are excerpts from an excellent transcript of an RAF Pilot’s letters home (and more). The full transcript can be found by clicking the link below. These all relate to his brief stay at Nannau in 1918. Visit the Website. You will have been waiting some time to hear from me but I was too late to catch the post here on Saturday when I arrived and there was no post today. I travelled down as far as Llangollen with a New Brighton gent, one Mr Lodge by name of Grove Road and I arrived at Llangollen prompt at 5.10 to meet one perfectly good RAMC captain at the station. 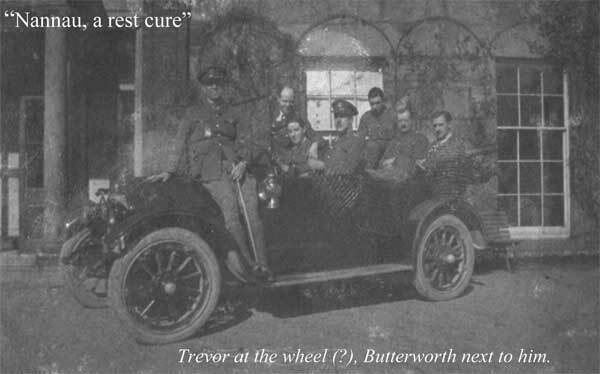 There were four other officers besides myself and we were conveyed by motor car to the hospital which is situated three miles from the small village of Dolgelley, right up in the hills. The hospital is a beautiful large house not unlike the Cenacle but larger and beautifully furnished and has only been used as a hospital about three weeks. As far as I can see it is absolutely money for jam. We have breakfast at 9.00, lunch at 1.00, tea at 5.00 and dinner at 7.45. We have the whole day to ourselves but have to be in to all meals. I am in a ward with three other officers – the two captains and a “second loot” – there are also two vacant beds in the ward. I went to bed at 9.30 last night as I was rather tired and at 10.15 the sister brought me a glass of hot milk with something in – one of the officers said he thought it was Sanatogen but whatever it was it was very nice. At 8.00 this morning I was awakened with a cup of tea brought by a very nice nurse, after which I got up, washed and was down for breakfast at 9.00. At 11.00 a.m. I had a nice hot cup of chocolate. Now for things in general. The hospital is owned by Mrs Vaughan the wife of a Brigadier General. She is a very nice lady and is about the hospital. The sisters and nurses are very nice but are all ancient – you understand me better perhaps if I say “stricken with years”. The hospital is beautifully situated up in the hills and stands in its own grounds. It has accommodation for 50 officers but at present there are only 36 of us. For recreation there are plenty of nice walks and about two miles away there is a stream and a small lake where there is trout fishing. There is also shooting and I think that I will get more shots at rabbits before long. It is very quiet here and I am sure the rest will do me good. Unfortunately it is very cold here – there has been a downfall of snow but it is mostly cleared away now. When you send my clean shirt would you please send me my house slippers for they all use them here. You will find them in my valise, they are in the top or the bottom of it. Well mother dear will close now hoping to hear from you soon. Am already feeling better for my convalescence. With fond love to all. Trev. PS. We have a billiard table here so I am alright. Nannau Hall is listed as a neurological hospital. Such hospitals are intended for cases needing special but not prolonged treatment. Its use as a hospital will be counted in months rather than years and it will revert to a family home after the end of hostilities. Nannau Hall is an elegant 18th century house which at the time of Trevor’s stay is part of a large estate. It can trace its origins back to the 12th century and is thought to be the fifth house on the estate. The Vaughan/Vaughn family’s links to the estate also stretch back to its establishment. At some later stage the hall will be sold and its use 87 years later will be unclear although one report from 1986 will suggest that its fate is to be split into apartments and a restaurant. On this day the Bolsheviks finally sign a peace treaty with Germany and Russia is out of the war. This releases 70 divisions for use on the Western Front before the U.S. Army appears there in force. I was very pleased to receive your nice long letter this morning together with Auntie Lizzie’s and am now awaiting the parcel containing my clean shirt. Now I will answer some of your questions. Yes, I have seen the owner, Mrs Vaughan. She has all her meals with us and is very chatty. The dining room is a fair size room with seven tables in (small ones) and we sit round about six at a table for each meal. The meals of very nice but we do not get large helpfuls – possibly I am increasing my appetite. My fellow invalids are on the whole quite a nice lot – some of them really do look ill but I can safely say I look a “picture of health” to the ma- jority – at least I have been told so. The weather here has been warm and topping for strolls in the evening but during the daytime has been very windy. I went down to the town of Dolgelley with several others the other afternoon (three miles all downhill) and we went to the Royal Ship Hotel – the only place to go to for tea. There was no rationing for us and we had tea, bread-and-butter (plenty) and jam also some fresh caught salmon and then an egg for 2/6 – absolutely money for jam. Then we had a car (hired) back to our ho- (I nearly said Hydro – Ha! Ha!). I am going down to Dolgelley again this afternoon. Will close now hoping to hear dad is much better in health. With fondest love to all. Yesterday afternoon (Sunday) and the week before I have acted as sidesman at a little country church about a mile from here and yesterday the parson asked me to his home for tea. It was very nice. Yesterday morning I went with another “sub” to the lake about one-and-a-half miles from here and we got a small punt out of the boathouse and had a fine row all morning and returned to lunch feeling A1. Fondest love to all, Trev.